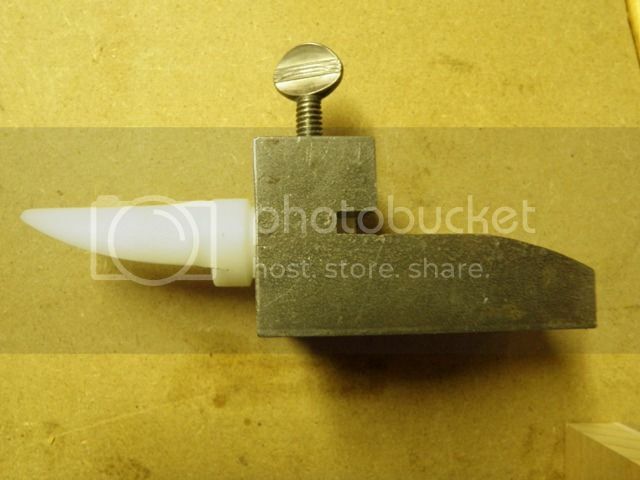 Here's a quick way to route out the air channel for your toneboards if you don't have a router table. I use a "handscrew clamp", a pair of Bessey clamps, and a Laminate trimmer with a straight bit (size of your choice). You will also need a way to hold your toneboard. I use an old metal toneboard jig. One can easily be made out of wood. The jig here is only used for securing the toneboard. First bore out the delrin rod with the bit of your choice. I use BigB's method of constructing my toneboards. Shaping the radius on a disc sander. After establishing the basic shape, I chuck the shaped toneboard in the jig backwards, and upside down. Next I clamp the fixture between the jaws of the handscrew clamp. I keep the metal block flush with the top of the handscrew. The beauty of this set up is that the block holding the toneboard can be tilted to change the cutting angle in the final set up if desired. Next I use the Bessey Clamps to clamp the handscrew clamp to the edge of the table. But at the same time I use the side of the clamps to act as a fence to guide the router. Just make sure the router and bit are centered along the toneboard. And be aware of where the router bit is in relation to any metal parts. You don't want to hit the jig, or the metal rods of the clamps. 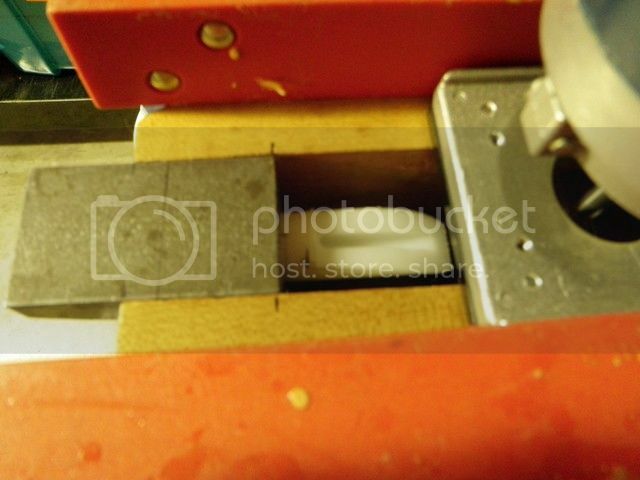 I mark a line along the back of the metal jig, up to which I will slide the router base, and then stop. Adjustments can be made quickly in regards to depth of cut, etc. Hope this helps. Wow that's sweet! Sure beats drilling a hole through the other side in a hope of making a good tone channel! Thanks this will really help! I like it Dave. 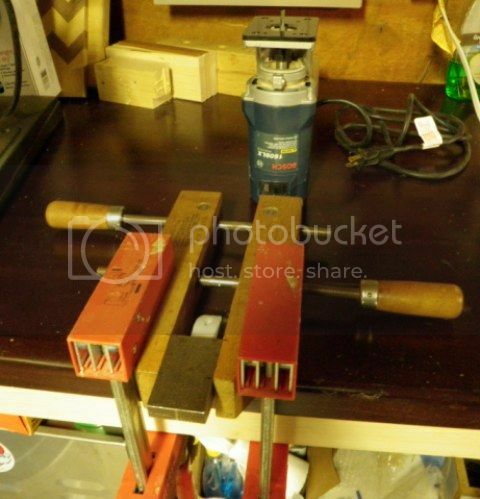 Very simple and easy to do with some clamps that are laying around the shop. Does it take a few minute to set up? I wander if it could be set up in a way where if there were lots of toneboards to do, there wouldn't be a lot of set up time between boards. I have seen this "cat" skinned a lot of ways, and this is one of the better ones. Brian, it's fairly quick to set this up. I have not done a bunch of toneboards at a time, so I don't know how fast it would be? I'm sure a set up could be made with some quick release toggle clamps to clamp the jig in place. Along with some adjustable fences. 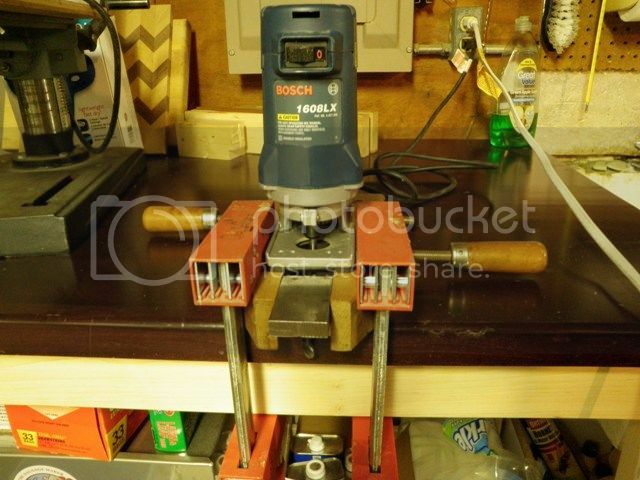 I prefer this set up for safety verses a router table, where the jig and toneboard are slid along a single fence into the router bit. Here I just feel I have more control with a fence on each side, and the small router facing down. I hit my thumb and index finger on a router bit one time!- Stupid, careless mistake. Luckily, there was minimal damage. But it felt like someone hit my digits with a baseball bat! Hopefully someone will take this idea and improve on it. Like Marvin said; "There's more than one way to skin a cat."